Everyone who likes horses and ponies will have dozens of photographs of either their own horse, or one's taken at horse shows, leisure rides, or pony club events. Now Native Ponies Online give you the chance to show everyone your favourite pictures. There is no charge to create your own gallery and put your pictures online for everyone to see. All you need to do is register with the gallery. 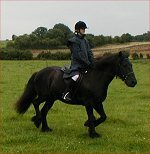 By registering you agree to the terms and conditions of the Native Ponies Online Photo Gallery - click on the link below to see these terms and condiditions.